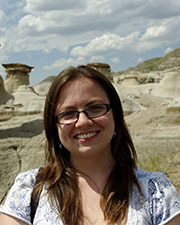 Sara is a research affiliate working in Invertebrate Paleontology. Her research interests are in isotope geochemistry, sedimentary geochemistry, and biogeochemistry. Worsham S., Holmden C. & Bélanger N. (2012) Magnesium isotope cycling within Acer saccharum (sugar maple). Mineralogical Magazine 76(6), 2554. Worsham S., Holmden C. & Bélanger N. (2011) Magnesium isotope fractionation in a hardwood forest of Southern Québec, Canada. Mineralogical Magazine 75(2), 2178.